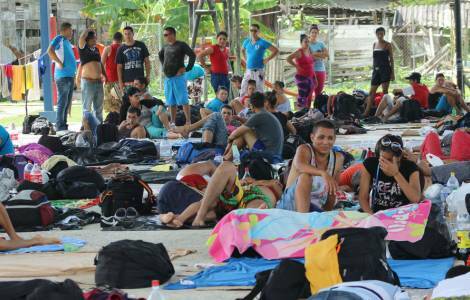 AMERICA/PANAMA - Conclusions of the Assembly of Bishops: "Let us not allow negativism to paralyze us"
Panama City (Agenzia Fides) - The Bishops of Panama have published a document at the conclusion of the 209th Plenary Assembly of the Panamanian Episcopal Conference (CEP) held from February 25th to March 1st. "With the hope of orienting and forming the people of Panama, we Bishops want to share our reflection on the ecclesial and social reality of the country", this is how the document begins, which proposes 4 points for each section. Regarding the ecclesial reality, the Bishops express their gratitude to the Panamanian people for World Youth Day, which "commits the Church to give young people opportunities for participation in the structures of the Church and society, so that they can take on the challenges of social transformation in the face of injustice, indifference and the negativism of change". In the wake of the Synod for Youth, the Bishops intend to give new life to Youth Ministry, to create dialogue and common work, updating on the use of new technologies to evangelize the digital world, with special attention to the indigenous peoples. The text of the CEP recalls the publication of the document "Protegiendo Nuestro Tesoro" which places the Panamanian Church in the wake of the protection of minors, with the same force and decision that the Holy See asked for. In this first part the new presidency of the CEP is also presented. President: Mgr. Rafael Valdivieso Miranda, Bishop of Chitré; Vice President: Mgr. Pedro Hernández Cantarero, CMF, Bishop of the Apostolic Vicariate of Darién; Secretary General: Mgr. Manuel Ochogavía Barahona, OSA, Bishop of Colón-Kuna Yala. "As a Church, we cannot be indifferent to the drama that takes place at our borders, where hundreds of people migrate with great difficulty, at the risk of their lives, exposed to trafficking networks, in truly painful conditions", the Bishops write in the part dedicated to the examination of the national reality. "Unfortunately, the arrival of these migrants has generated stereotypes in some sectors, because they think that they take away work or carry diseases.There are even signs of xenophobia in a country whose vocation is openness, welcome and service to the world. The Church has the Christian commitment to welcome and protect the migrant, we cannot remain indifferent". On the participation in the political life of the country the Bishops write: "It is not enough to complain and mourn the vices of politicians and the distortions of politics. It is urgent to assume our social responsibility towards the neighbor, the excluded and the poor, which is a specific task of the laity. In conclusion, a reference to the upcoming elections of May 5: "We have a moral and ethical obligation to choose the best, which will be able to make a change to build a fraternal, just and equitable country, with transparency and responsibility. Let us not allow negativism to paralyze us and leave the fate of all of us in the hands of a few. We all have to vote next May 5, it is a duty and a right. Let us express a responsible and conscious vote, motivated in choosing those who really have a commitment to the dignity of the person and the common good".